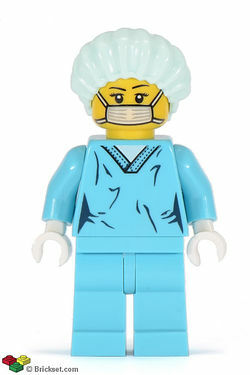 The Surgeon is a Collectable Minifigure released in 2012 as one of the sixteen minifigures from 8827 Minifigures Series 6. The Surgeon comes with a new hair net piece that is a bluish-green colour. Her head piece is like most minifigures is yellow but covers up her mouth with a white mask. Her torso is bluish-green and has printed wrinkles on it. She comes with the classic leg piece: Part:970c00. For her accessories she comes with a syringe piece that appeared in Series 1 and a new printed 2x2 X-Ray piece. On the X-Ray piece it shows the bones of a minifigure possibly from skeletons. The x-ray piece maintains the same proportions of the Skeleton minifigure. Her description relates to other themes such as Power Miners, Dino, and Alien Conquest.